A Hands-on Guide to Getting the Most From Your Chevrolet or GMC. 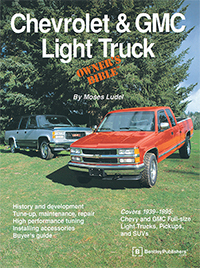 Moses relates the history of Chevrolet's engineering and technology advancements in the pickup and provides buyer's guide tips for both new and used trucks. In-depth preventive maintenance and tuning information covers General Motors engines from the classic Stovebolt and Jimmy sixes through the modern TBI V-8s. There's also a special section that explains how to build a 383 "stroker" small-block V-8 for maximum trailer pulling and off-road power. These engine modification steps are supported with procedures for upgrading the popular 700R-4 automatic overdrive transmission and manual transmission gear assemblies. Suspension modifications and lift kits are also covered. If you own a Chevrolet or GMC Light Truck, look no further-this is the essential book for maintaining, modifying and enjoying your truck.